Client is one of the large real estate companies, which has been found in March 2010. For a decade, from a brokerage company with few employees, the client has grown into a strong corporation with 12 member companies with a large network of agents and representative offices. In the context of the momentum of development nowadays, the client is undertaking a restructuring of the entire corporation to prepare for a new leap forward. This restructuring, coupled with the company development needs, the client recognizes the key role of information technology management 4.0. This is an indispensable factor in the restructuring strategy. Additionally, although all of client’s business processes were either manual or paper-based and it had little technological communication either internally or with its sister firm, the company was growing by leaps and bounds. In order to continue providing outstanding service to customers and meet increased sales demand, the company needed to modernize and integrate its system and improve its business processes. Because of these, the client seeks a reliable partner for building and implementing a secure and effective Enterprise Resource Planning (ERP) system. Simplifying the process and reinforcing the operations. Be always ready for future operations. This sector requires the most professional and flexible knowledge and integral management. Rationalizing the business operations as well as integrating all the business operations in the unique ERP System. With more than 10 years of experience in developing custom ERP solutions, MeU Solutions were up for the challenge! When developing the system we have to incorporate all the lessons learned from past experience. With our experience, we were able to anticipate many of the business challenges and started to add value even before understanding the specifics of every problem. It was conceived as a flexible solution that could be easily tailored to the business processes of our client that adopted it. This is one of our long-term projects and we are still working with this project with a dedicated and proficient team of 15 members to consult, design, implement and testing the complete ERP system. Analysis: MeU’s experienced techno-consultants worked with various client stakeholders to understand business specifics and the specific needs of the various departments. Once we had all the requirements, we defined the ideal system architecture & strategy that would meet various departmental needs, automate processes and enable communication through the value chain. Development: Based on the approved design specifications, our technologists worked with the client’s business units to develop the ERP system on a module-by-module basis, ensuring each module developed connected with the existing one and provided streamlined operations. Testing: Our in-house QA team tested the product thoroughly. The product had to meet MeU’s high-quality standards and be compliant with the client’s business requirements. Our proprietary testing processes (Context-Driven Testing, Exploratory Testing, Automation Testing, Performance Testing, and Security Testing) helped to improve performance, security, and quality of services for internal users, external users, consumers, and speed up the time to market for the solution and cut customer losses. Improvement: At MeU, we are never content with developing a good product. We strive to develop a product that would maximize business value for the client. In line with these principles, even after successful delivery, our team analyzed operations and further improved the delivered solution for the client. Test environments and processes are standardized and the deployment on QA systems are automated. All pre-testing tasks, cleanups, post-testing tasks, etc. 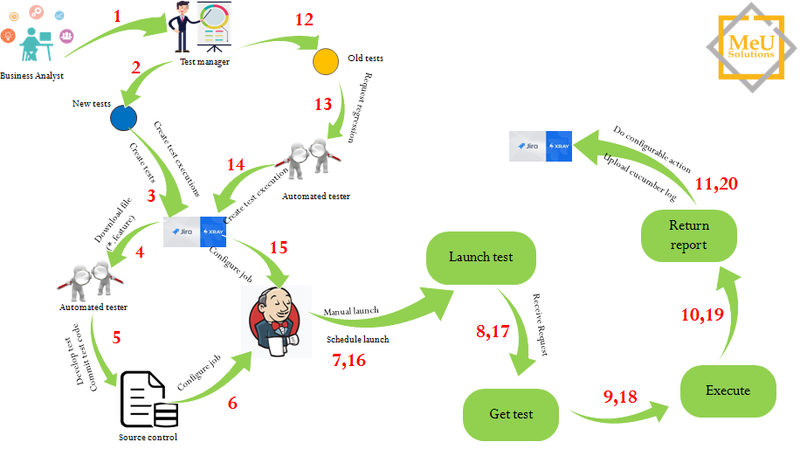 are automated and aligned with the Continuous Integration cycle. There are many ERP modules in this ERP system needed by the client. Each module of an ERP system corresponds to a major functional area of an organization. An ERP system is designed to include modules so that it is easy to access a particular option; it is easy to train staff, easy to provide security features, and the app is intuitive, dynamic and simple to use, staff finds it easy to understand. Helped customer define the long product roadmap and consulted them the new technologies and platforms to implement. Provided the intensive skill resource to design the complete systems that can reuse, scale and save cost. Advantages associated with working with a DevOps team with a diverse and comprehensive skill set. Efficiency in end-to-end business processes by streamlining internal and external operations. Elimination of manual entries and reduction of errors due to human mistakes. Improved decision making through achievement of data integrity and real-time reporting. Reduce workload for staff such as HR, providing transparently mapping the HR procedures, Timekeeper machine with Payroll calculation. Total satisfaction with their new, improved and easy-to-use ERP system.